Great News for the fans of the new classic ride at EPCOT! As announced at the D23 Expo the Disney Parks Blog let the world know today when that a new experience is coming to Mission: SPACE that will thrill younger riders! Starting Aug. 13, we will relaunch the attraction with a brand new experience and an enhanced version of the “classic” Mission: SPACE. When attempting word associations using Disney parlance, one is unlikely to pair Epcot and thrill rides together. Some hear Epcot and immediately think of World Showcase or the International Food and Wine Festival. Others hear Epcot and think of the iconic Spaceship Earth or its flagship attraction, Soarin’. Others, like me, hear Epcot and immediately think of the recently departed Maelstrom. Getting back on point, Epcot is home of one of the best thrill rides that Disney World has to offer – Mission: Space. Hidden away in Future World East, Mission: Space is a fantastic attraction that is sure to please novice stargazers and expert astronauts alike. – Mission: Space allows riders to choose the intensity of their voyage to the Red Planet. Those people who want a tamer experience should select the green voyage. The green voyage is less-intense and does not involve the centrifugal spinning offered by the orange journey. Regardless of the ride experience you choose, the ride interior is very small, so those people who have issues with small or enclosed spaces may want to consider going to the Advanced Training Lab to assist with those essential activities that can be accomplished from the safety of the ground. – each ride vehicle houses four astronauts. Navigator, Pilot, Engineer, and Commander are all members of the space crew and each has their own responsibilities for the shuttle during the flight. I particularly enjoy the flights that leave one (or more) flight positions unfilled and then you can attempt to do two people’s roles. – when you enter Mission: Space, you get to see a variety of tributes to manned space flight throughout the world. You can also see historic replicas of important pieces from NASA, including a moon rover from the Apollo program. In my experience, wait times are generally pretty quick, so be sure to take some time to enjoy the pre-show. – Capcom in Mission: Space is Gary Sinise (of Apollo 13, Forrest Gump, and Mission to Mars fame). I always love the entertainers that Disney is able to get to assist in taking attractions to the next level – Martin Short in “O Canada!,” Dame Judi Dench as the narrator in “Spaceship Earth,” and even Rod Serling at the Twilight Zone Tower of Terror. Capcom will explain to you the entire process of getting you and the rest of the crew settled in and on your trip to Mars. – Test Track is the fastest ride at Disney World, propelling you to speeds of 65 miles per hour. Expedition Everest takes you on a journey to find the Yeti and has you travel backwards for a period of time. Rock and Roller Coaster has two loops and an inversion. All of this sounds impressive, but do any of these rides come equipped with motion sickness bags? Nope. Mission: Space is the lone ride to hold that distinction. Mission: Space offers a lot for the entire family to enjoy. It even has the Advanced Training Lab for those in your family that may not meet the height requirements or may have had too many cronuts (located at the Refreshment Port in the beginning of World Showcase). Aside from the typical mission control activities, it also offers a playground for the smaller members of your party. 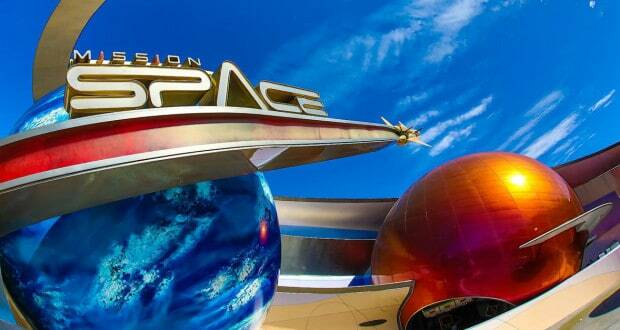 Mission: Space is an an oft-overlooked attraction that should earn a spot on your list of things to do at Epcot!